Aluminum enclosures can be used for a wide variety of applications with irrigation pump covers being a common application. Safe-T-Cover sees requests for booster pumps, glycol pumps, air conditioning pump systems and many others. Recently, we completed a custom project for a nationally known dairy company which needed two irrigation pump covers. Why would You need to cover A pump system? The main reason our customers have told us they need an irrigation cover for their pumps is protection. In some instances, moving the pumps outside saves valuable space inside the facility for production. Once outside, the pump needs protection from rain, flying debris, vandalism, and freezing temperature conditions. When the system goes outside, a pump cover easily provides the needed protection. In addition, they would also prefer to accomplish a couple of additional goals when covering their pumps. Recently, we worked on an irrigation pump cover for multiple large irrigation booster pumps at a dairy company. The system consisted of two large centrifugal pumps located outside. 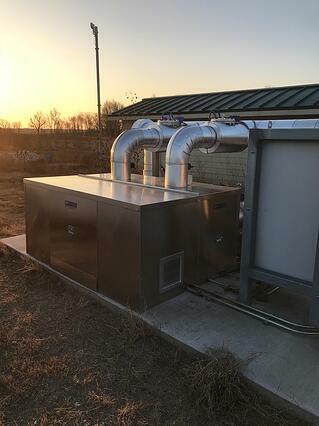 The customer challenged us with providing them an aluminum enclosure that covered both pumps, allowed for the supply and return piping to pass through the enclosure, provided ventilation to allow heat generated by the pumps to escape, and kept everything warm during the winter months. In addition, the customer needed removable access panels in specific locations to allow for routine maintenance and repair. The good news for the dairy company is our enclosures are capable of meeting all of those needs. After a few back-and-forth emails and calls, we were able to customize an enclosure that met all of the requirements. From the picture, you can see the installed louver on either side of the enclosure to vent the heat from the pumps. We designed the enclosure to have three access panels to provide easy access to the pumps for maintenance. Each panel has a built-in pad lockable folding T-handles to prevent unwanted entry. The customer field cut the penetrations for the insulated supply and return piping. Field penetrations are simple for the contractor to perform and do not void the Safe-T-Cover warranty. At least one major enclosure manufacturer will not honor the warranty if penetrations are cut in the field. The enclosure itself is anchored to the concrete pad on the inside of the enclosure using mounting brackets and concrete anchor bolts provided in the hardware kit that comes with the enclosure. All of our aluminum enclosures include 1 ½” thick insulation panels on the sides and 3 inches of insulation on the roof. 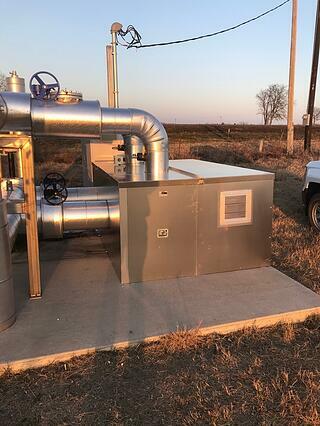 The enclosure is also equipped with one of our 1000 watt patented slab heaters that are rated to keep the inside air temperature of 40°F while the outside temperature is as low as -30°F and are designed to operate even when sprayed by water. Our first communication with the customer was mid-November 2017. We received the purchase order for the irrigation pump cover a few weeks later in the middle of December. The enclosure was manufactured and left our shop on January 17, 2018, which is about two months after our first conversation with the customer. Prompt service is typical of the Safe-T-Cover staff as we are usually able to provide a custom enclosure quote within a day and ship most custom projects within four weeks of receiving the order. We are proud to have accomplished our client’s needs and are looking forward to seeing how the second custom enclosure they purchased turns out once they install it.